Until All have Heard: New Orleans Pics and Stories! New Orleans Pics and Stories! 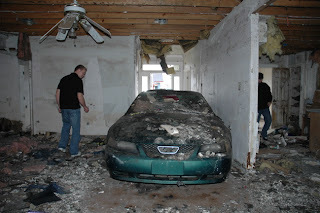 The one of the Mustang in the Living Room was in one of the worst places Katrina hit.... i took the pic from the "door way" where we think the car broke through and ended where it sits..... that house hadn't really been touched in a year and a half.... gross! 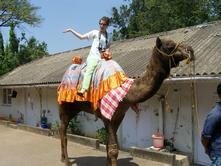 it stunk really bad. 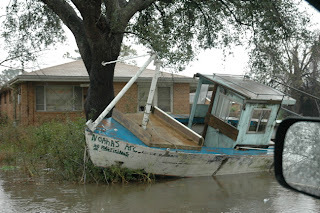 and the Noah's Arc one, was on like day3 it was raining in N.O. harder than it has since Katrina..... causeing TONS of flooding..... so we went out driving.... "Noah's Arc" however has been in that yard since the 25 foot wall of water brought it there a year and a half ago! yikes..... here's the analogy we got about how fast the water was moving after the levys broke: in comparision to a sandcastle being destoyed by water from a fire hose!!! yikes again! 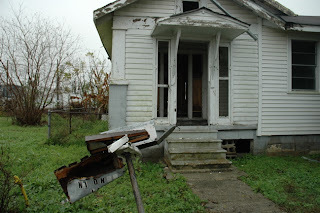 The one of the mail box was just really strange.... so mangled and the house was vacant... every house had a story and i wish walls could talk... It would be so interesting to hear all the stories. More New Orleans Pics and Stories!